A fire is a source of comfort and heat and the focal point of your campsite for conversation with groups of friends and family. Although most people can't imagine outdoor camping without a campfire, most don't use it for cooking because since the advent of a wide variety of camping stoves. 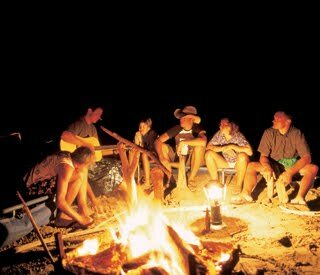 Beginners and modern campers often forget, however, that a campfire can mean the difference between life and death in a survival situation. In freezing weather conditions, the ability to build a campfire can save you from hypothermia if you're caught out in the cold winds without adequate shelter or clothing to keep you warm. This is especially true if you've gotten wet and have no way to dry your clothes. I could very well be a dire situation without a fire. Building a campfire in adverse conditions, like falling rain or snow may seem impossible for today's urbanized camping enthusiasts. But people of naive and frontier cultures have always depended on fire for daily cooking and warmth, and they were proficient in building them...they had to be. You too can build a fire under these conditions, as long as you understand how to do it and practice it often in better conditions. Most people dismiss building a campfire as a no brainer, just get some wood and put a match to it. Genuine backwoods experts know that building a fire is an art and their ability to quickly build fires that hotter, brighter and more reliably certainly bears this truth. Wet and rainy weather is probably the greatest challenge to those building a fire. Fires depend on combustible material, and in the woods that means twigs, dry leaves, branches and loose chunks of wood. If it's raining, how do you go about finding dry wood? It's really easy if you know just where to look. Not every piece of wood in the outdoors gets soaked when it rains. The easily gathered branches you find lying on the ground that work good in fair weather will be wet, so you'll have to look elsewhere. Standing trees are less likely to absorb water than those on the forest floor. Often, you'll find dry dead branches at the base of pine and spruce trees, as these fallen branches are shielded from the rain by the dense needles on the living branches. The outer bark of the limbs may be wet, so you'll need a knife to cut it away to reach the dry wood inside. 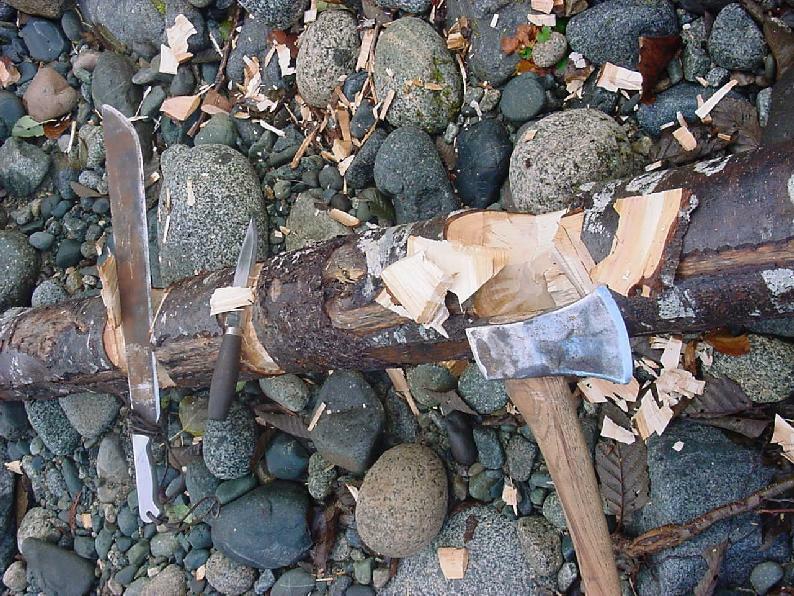 Building a fire in the rain will be alot easier with a large knife, a machete or an axe. 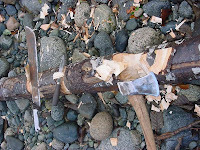 A sharp cutting tool, which will prove to be one of your most important pieces of outdoor camping equipment, gives you the ability to split big pieces of wet wood to get to the dry interior. 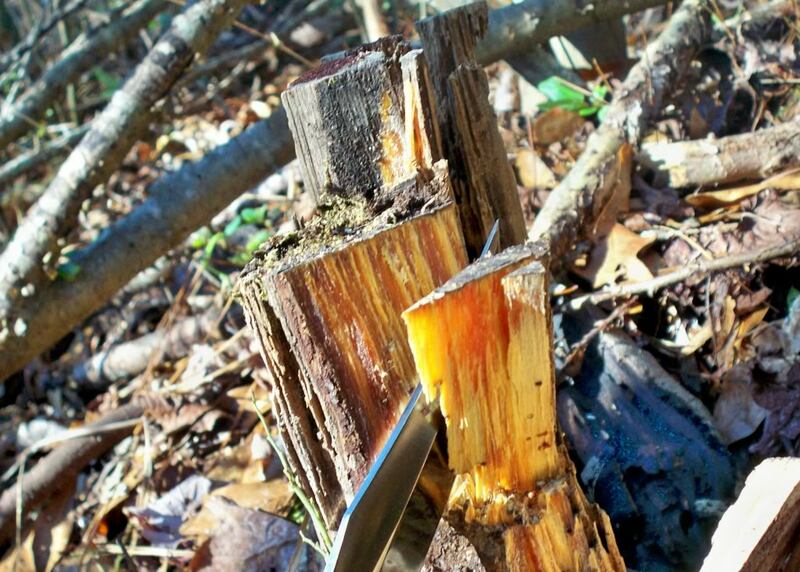 You can even cut down small dead standing trees that you can split into pieces of fuel. Old stumps are sometimes full of concentrated pine resin. These are called "lighter knots" by country folk. This resin-rich wood will burn with a very hot, bright flame, even in the rain, if you cut it into small pieces of kindling to light it. It's easily identifiable by the smell and color of the wood when you first cut into it. It smells like tar or pine pitch, and it's orange or bright yellow inside with oozing sap. It's also a lot heavier than regular wood. You can find it in any forest where there are pine, spruce and cedar trees. When you've found a find a source of ignitable fuel, try to locate your campfire someplace that's partially sheltered from falling rain. If you can find a stand of dense trees or a rock overhang, you'll be able to keep the fire burning a lot easier once you've located a source of dry wood. Don't give up on building a campfire just because it's raining! Remember, there's always dry wood laying around somewhere in the forest, but it might take a little effort, and a sharp blade, to get it. Get my free camping ecourse and free ebook, Essential Camping Tips. Head over to www.essentialcampingtips.com. I've been camping for over 30 years and nothing compares to sleeping under the stars! I share my passion for the outdoors with other camping enthusiasts and offer a free mini camping ecourse that will help make your next camping trip an adventure. Camping with the family is a wonderful idea, planning it out carefully can provide to be absolutely fun.